Few people have spent as much time on the water in various capacities as this month’s featured Long Island Sound Native. Like many accomplished sailors, Hank Schmitt is a product of the Junior Yacht Racing scene in his early days. Hank first started sailing at Huntington Yacht Club as young as they would take them back then at age 7. He wrote an article for a “Yachting” magazine writing contest and won 1st place for his article about crewing for his sister in their first Larchmont Race week in 1969. From Dyers and Blue Jays Hank moved to Centerport Yacht Club’s Junior Sailing program and progressed to Fireballs, representing Centerport three years in a row at the LIS Junior Championships. In High School Hank sailed for Portsmouth Abbey in 420’s, and whatever boats other schools had for team racing. In 1975 Hank won the Individual High School best skippers award in tech dinghies at the Coast Guard Academy in New London. At the same time Hank was working summers at Willis Marine Center, pumping gas into boats, running a launch, and other summer yard work. Hank got some big boat experience in the Dorade Trophy and Black Rock Yacht Club regattas held for junior sailors on big boats in the summer. His Dad also had a Cal-2-30. In 1977 after graduating High School Hank flew to Florida with a one-way ticket and $80 in his pocket to hitch a ride in the SORC. The night before the first race Hank signed aboard a Morgan One Ton, Zantara” from Atlanta Georgia. Being the token Yankee it was not until the last race, six weeks later, that Hank got to skipper the start and first upwind leg to the only trophy the boat got in the six race series, a 2nd place to Ted Hood aboard one of his “Robin’s”. At 19, Hank drove south to Houston Texas to start a career working offshore oil rigs working 28 days on 28 days off in Canada, Columbia SA, Republic de Congo Africa as well as his first Trans-at from Boston to Sicily on a 400’ Drill ship at 8 knots. He started out with his Merchant Marine Z-card in the deck department painting and shipping a lot, but quickly moved up to a storekeeper’s position. After 7 years when the oilfield went bust in 1985 Hank returned to Huntington New York and a job rigging boats at Willis Marine Center July 1st, and was delivering his first boats to the Chesapeake July 4th. His first long trip to Florida was in 1986 aboard an Irwin 39. He has been delivering boats for the past 21 years averaging over 100 days at sea and 10,000 per year for well over 250,000 miles. One of his early deliveries in 1987 was a repossession of a 2-year old Tayana 37 that was down in Norfolk VA. Hank ended up buying the boat from the bank, renamed her the “Hunk-a-Schmitt” and lived aboard for 13 years. In 1992 Hank took 10 months off to participate in the “America 500”, a Jimmy Cornell event following Christopher Columbus’s route 500 years later. He even put his boat in the Columbus Day Parade. Hank sailed solo to Europe for the start and visited 8 countries, sailed 12,000 miles and visited 25 ports in 10 months finishing with a solo mid March passage sailing directly from St. Thomas to New York. In 1997, Hank put together the American Fleet for another 500th anniversary, this one to Newfoundland and John’s Cabot’s quintcentenial, a two month trip up to Newfoundland and back. In 1999 Hank overextended himself and put a fleet of 11 boats together for the “Millennium’s First Sail” an around the world rally being in New Zealand for the 2000 Americas Cup and in Sydney Australia for the Olympics. In 1987, Hank started his own rigging and dive service company called the PYCC (Personal Yacht Care Company). With nothing to do in the winter and to cover another of one of the three most dangerous jobs in the world, Hank commercial fished out of Montauk New York for three winters aka “Perfect Storm”. The first two winters were spent bottom fishing for tile fish on 2,000 hooks twice a day, three handed on an 81’ foot boat. The third year the crew followed the big fish south and packed out of Cape Canaveral Florida. The biggest catch was a 734 lb Blue Fin that was sold for $15, 0000. The last twenty years Hank has spent, on average, 100 days a year at sea and 10,000 miles. Since he was always running out of crew for deliveries, in 1993 he started a crew networking service to help get others offshore called Offshore Passage Opportunities. Today there are over 1900 members. Each fall since 2000 Hank organizes the annual NARC Rally (North American Rally to the Caribbean) between Newport and St. Martin with a stop in Bermuda. 2007 will be third winter skippering a Swan 48 named “Avocation” in the big boat Caribbean Circuit. They were 2nd at the Heineken Regatta 2006 and 3rd in the 100th Anniversary Newport to Bermuda. 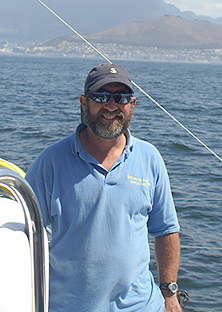 Hank started the 2007 season of well with a 6,000 mile delivery from Cape Town South Africa to Grenada on a 39’ “Scape”catamaran. An article in the January Issue of Sail magazine tells about this passage. If you ever want to get involved or learn about offshore sailing, just give Hank a call and he will be happy to show you how. Anyone visiting New York on the north shore of Long Island are encouraged to visit our waterfront offices located in Halesite and meet with us. Our office boasts super size map of the world. By joining OPO you will become privy to our data bank of information regarding Current Opportunities which connects captains with crew. Join now by filling out the short application form. Send it to us with a check for $199.00 made out to "Offshore Passage Opportunities", and you'll be started on the path towards offshore experiences of a lifetime.